This photo shows the front and back of a 1943 steel penny. 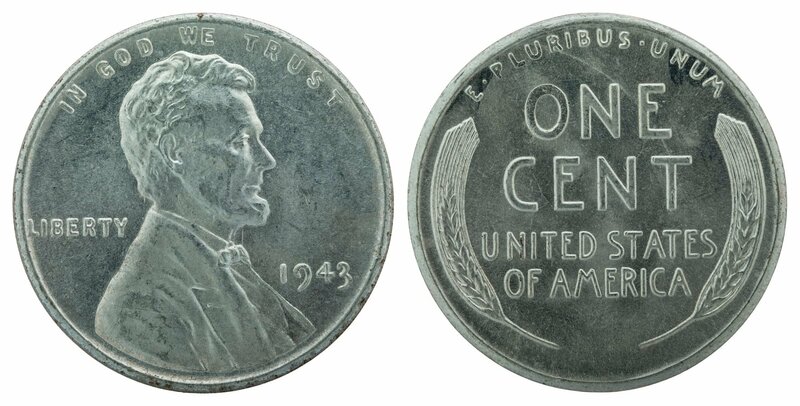 These were nicknamed; "Wartime Cent," "Steel War Penny," and "Steelie" during World War Two. During World War 2, copper was used to make shell casings, wiring, and military equipment, along with pennies. As tremendous amounts of copper was needed for the U.S. war effort, the United States Mint researched into new designs for pennies using different kinds of metal and even plastic. It was decided that the new penny would be made of low-grade steel coated with zinc. As with the old pennies, they were struck in San Francisco, Denver and Philadelphia. But, the new penny had problems, it was magnetic, 13% lighter than the copper penny, the zinc coating oxidized, the edges would rust as that part was not coated and were often mistaken for dimes. The steel penny was also made in 1944, however, due to a stamping error, all 1944 steelies were marked with 43. The war penny was replaced by the shell casing penny (made of used ammunition casings) later in 1944.